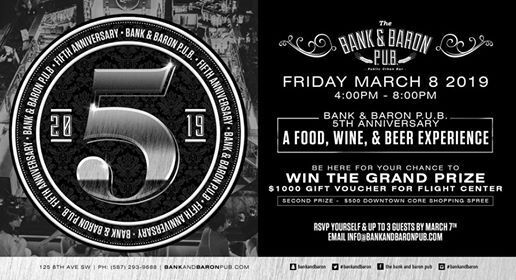 The Bank & Baron would love to personally invite you to join in celebrating our 5th anniversary! On the afternoon of Friday March 8th we will be creating a beer, wine & food festival experience to showcase our best products and to celebrate with our amazing customers! You are welcome to join us at any point between 4pm and 8pm but please note that tables will be available on a first come first served basis. 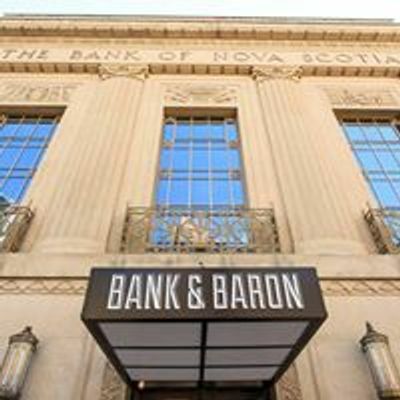 The Bank & Baron truly appreciates all of your support in 2018 and it has been our pleasure hosting your reservations, parties and corporate events. We are excited to continue working with you in 2019. Please e-mail aW5mbyB8IGJhbmthbmRiYXJvbnB1YiAhIGNvbQ== to RSVP for yourself and up to 3 guests. We look forward to celebrating with you! 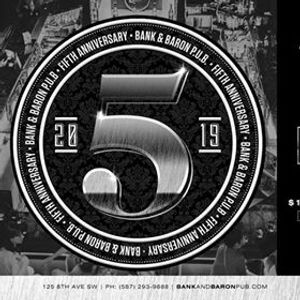 The Bank &amp; Baron 5th Anniversary Celebration!